mTOR stands for mechanistic target of rapamycin. It is a protein found inside most cells and is responsible for regulating cellular growth by sensing and integrating diverse nutritional and environmental cues. Excessive activation of cell mTOR is implicated in the chronic diseases plaguing our aging population such as cancer, type 2 diabetes, and obesity. 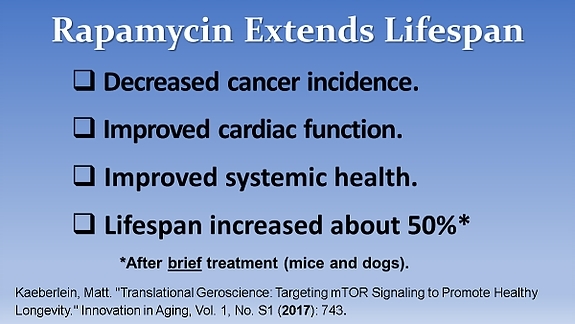 Lowering mTOR activity extends life span in laboratory models by delaying the development of chronic diseases including cancer. Our very existence—our individual creation and growth into adulthood—was dependent on highly activated mTOR in our cells that fueled their rapid proliferation. With aging or excess calorie intake, most people’s mTOR remains at dangerously high levels of activity long after we’ve ceased growing. If the body no longer needs to grow in size and mature, but mTOR activity remains high, something else can start to grow: cancer. Lowering mTOR signaling has in fact been shown to reduce cancer. Turning down mTOR has additional benefits, including turning on autophagy to help rid cells of accumulated debris. Studies in elderly people indicate improvements in immune functions in response to mTOR inhibition. 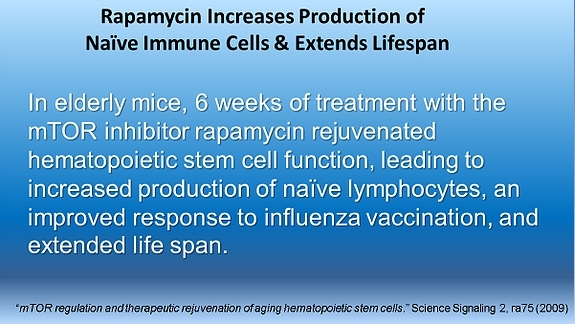 Aside from very extreme calorie restriction, which is impractical for most people, the most efficient way of suppressing excess mTOR is using a drug called rapamycin in the dose of about 5 mg once a week.